Delivered new to King Motor Co. in Fort Lauderdale, Florida, this 1969 Oldsmobile Hurst/Olds is possibly one of the finest examples on the market today of the car that jump-started Oldsmobiles late-60s transformation from a symbol of blue-haired obsolescence to one of brash muscle-car performance. The first Hurst/Olds was a special gift from Jack Doc Watson, head of Hurst Performances research division, to his boss George Hurst. 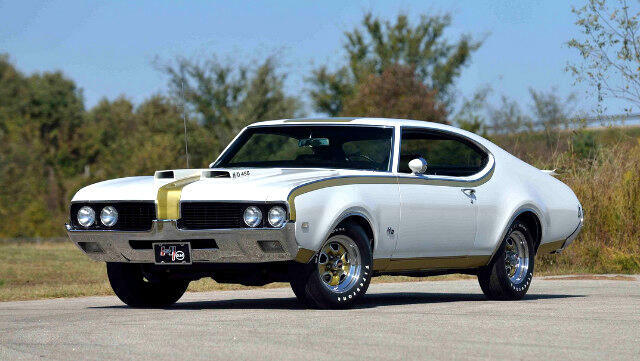 Based on a 1968 Olds 442, the car packed a Ram Air-fed 455 CI engine from Oldsmobiles full-sized luxury line. Hurst loved it, and so did Oldsmobile management. They appointed Hurst to build copies, enabling the car to bypass GMs corporate limits on engine displacement in its intermediates. More than 3,000 orders poured in from excited Olds dealers, but that demand far outstripped the 515 Hurst eventually produced, so the package was offered again in 1969. This time the livery was a more eye-grabbing white with Hurst-inspired Firefrost Gold trim and graphics, gaping twin hood scoops and a functional rear spoiler that produced substantial downforce at speed. Although slightly detuned from the previous year, the torque-rich 455/380 HP engine still featured W-30 heads, cam and ignition, and W-30 Forced-Air induction. The mandatory transmission was a Hurst Dual Gate-shifted modified 400 Turbo Hydra-Matic. A frame-off nut-and-bolt restoration completed approximately 12 years ago, this multiple award-winning 1969 Hurst/Olds is documented with two broadcast sheets, shipping documents from Hurst to King Motors and the dealer acceptance receipt. Listed in the Hurst/Olds Registry as number 226 of approximately 906 built, it is one of the most highly optioned cars produced, incorporating factory air conditioning, power steering and brakes, 3.23:1 limited-slip rear end, power drivers seat, cruise control, tilt steering, tic-toc-tach, speed minder, courtesy light group, power trunk release, AM/FM stereo with 8 track tape player and Firestone G70-16 raised white-letter tires on distinctive Gold Rallye wheels.